One of my buddies at Full Sail recently lost his long-time companion, Bruiser. 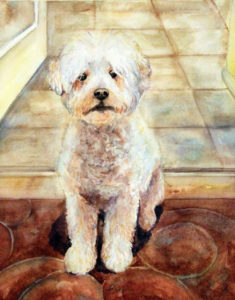 When I was asked to paint Bruiser, it was a huge honor because I know how hard it is on an owner when they lose a pet. Not to mention, Bruiser was adorable. Check out that sweet face. I thoroughly enjoyed painting his cute puppy eyes and nose in a limited palette.